What’s so rare as a day in June? The birds in North Carolina sang the song of the world as Marcy Vaughn asked us to breathe in and then allow our outbreath to form sacred syllables of the Bön tradition of Tibet. With each outbreath the connection between the inner world and outer world became more palpable and I became more present, more aware of my being-ness, my mind slowing down as the fire burned in the center of our circle. The Cherokee singer, Paula Nelson, spoke of grief and unspeakable loss, and of the spiritual wisdom and healing powers of the sacred waters that form one being across our earth. The water song she sang opened a door to possibilities of new beginnings. We listened and were moved by her fortitude and gentleness. On the same day, by the shores of the Pacific Ocean, Chief Ernie Salas, the 85-year old leader of the Kizh people, radiated love and blessings to the people who gathered. He and his family shared stories of what Los Angeles was like before the missions, in a time when people gathered all their own food and medicines from the land and the water. The maiden voyage of our new program, Voices of Wisdom, set sail in this beautiful month of June. These regional gatherings are children of Ancient Wisdom Rising, where elders from the wisdom traditions come together to speak and share their stories and knowledge so that we may sow seeds for our collective future. Three gatherings took place in the first two weeks of June. The first was in Brookfield, MA with Kahontakwas Diane Longboat (Mohawk) and David Tall Pine White (Nipmuc). The following weekend we book-ended the continent with Marcy Vaughn (Tibetan Bön) and Paula Nelson (Eastern Band Cherokee) in Greensboro, NC and Chief Ernie Salas (Kizh/Gabrieleño) and Chief Caleen Sisk (Winnemum Wintu) in Santa Monica, CA. Seventy-five people attended these events to engage with the wisdom keepers, each featuring two elders, one of which represented the traditional people of the local area. We hope this begins a long overdue dialogue and builds relationships between the Sacred Fire Community hamlets and the traditional peoples of the lands where these community fires take place. There were many tears of joy, grief and recognition as the audiences were moved by the presence of the elders. On Sunday evening, specialty fires were held by the Fire Keepers allowing for rich expressive conversations to unfold. These were a testament to the power of Saturday’s gatherings. 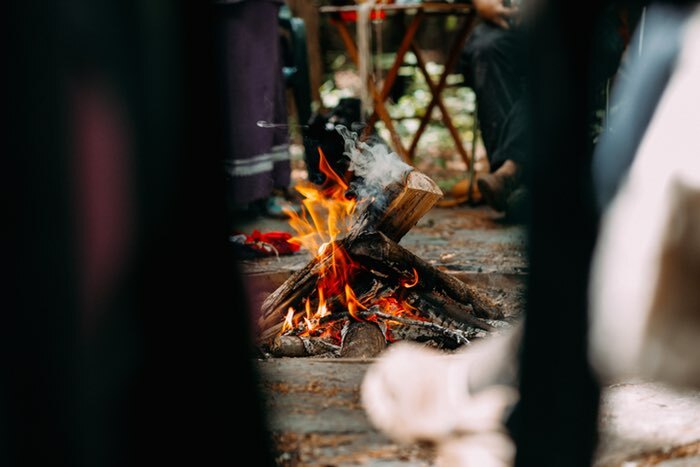 We are grateful for the efforts and contributions of all our volunteers and donors who supported this endeavor in helping to connect the work of the Sacred Fire Foundation with local communities.